RJD's Tejashwai Yadav announced the Bihar Mahagathbandhan seat-sharing pact on Friday. RJD to contest on 19 seats including Bhagalpur, Banka, Madhyapura, and Darbhanga, RLSP to contest on five seats and Congress to contest on nine seats. New Delhi: A day after Tej Pratap Yadav, the elder son of Rashtriya Janata Dal (RJD) chief Lalu Yadav stepped down as the president of the party’s student wing, his brother Tejashwi Yadav announced the mahagathbandhan seat-sharing pact. “RJD to contest on 19 seats including Bhagalpur, Banka, Madhyapura, and Darbhanga. 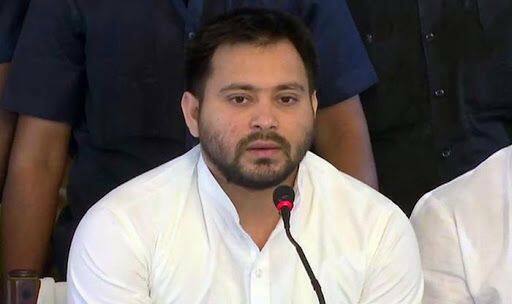 RLSP (Rashtriya Lok Samta Party) to contest on five seats, Congress to contest on nine seats including Patna Saheb… Sharad Yadav to contest from Madhepura, Sarfraz Alam from Araria and Misa Bharti from Pataliputra,” Tejashwi said at a press meet. Lalu Prasad’s elder son Tej Pratap Yadav’ father-in-law Chandrika Rai will fight the election from Saran. Apart from the Congress, RJD and RLSP, HAM(S) will contest on three seats, VIP on as many seats and CPI(ML) on one seat. “I am stepping down from the post of the patron of RJD students’ wing. Those who think I am naive don’t know that I know everything.” Moments before he had tweeted best wishes to the newly appointed state president of the wing, Gagan Yadav. Later, speaking to Zee News, he hinted at a rift within the family by saying that he had asked Tejashwi for two tickets but didn’t hear from him. He said, “I am willing to sacrifice my life for my people.” He added that patriarch Lalu Yadav should realise that the RJD is because of the public but, he rued, his father doesn’t get to hear many things. Elections to the 40 Lok Sabha seats in Bihar will be held in seven phases between April 11 and May 19.